These selected resources offer high-quality information about tobacco and oral health. Use the tools below for further searching, or contact us for personalized assistance. Share these facts to help improve the oral health of pregnant women, children, adolescents, and their families. Wiener RC. 2013. Association of smokeless tobacco use and smoking in adolescents in the United States: An analysis of data from the Youth Risk Behavior Surveillance System survey, 2011. Journal of the American Dental Association 144(8):930–938. Wiener RC. 2015. Children, sealants, and guardians who smoke: Trends in NHANES 2001–2002 to 2010–2012. Dental, Oral and Craniofacial Research 1(1):3–9. Jannat-Khah DP, McNeely J, Pereyra MR, Parish C, Pollack HA, Ostroff J, Metsch L, Shelley DR. 2014. Dentists’ self-perceived role in offering tobacco cessation services: Results from a nationally representative survey, United States, 2010–2011. Preventing Chronic Disease. 11:E196. Davis JM, Arnett MR, Loewen J, Romito L, Gordon SC. 2016. Tobacco dependence education: A survey of US and Canadian dental schools. Journal of the American Dental Association 147(6):405–412. Omaña-Cepeda C, Jané-Salas E, Estrugo-Develsa A, Chimenos-Küstner E, López-López J. 2016. 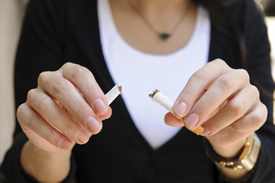 Effectiveness of dentist’s intervention in smoking cessation: A review. Journal of Clinical and Experimental Dentistry 8(1):e78–e83. Tomar SL, Fox CH, Connolly GN. 2015. Electronic cigarettes: The tobacco industry’s latest threat to oral health? Journal of the American Dental Association 146(9):651–653. Moyer VA. 2103. Primary care interventions to prevent tobacco use in children and adolescents: U.S. Preventive Services Task Force recommendation statement. Pediatrics 132(3):560–565. Rolle IV, Kennedy SM, Israel A, Everett Jones S, Bunnell R, Caraballo R, Xu X, Schauer G, McAfee T. 2015. Cigarette, cigar, and marijuana use among high school students—United States, 1997–2013. Morbidity and Mortality Weekly Report (MMWR) 64(40);1136–1141. This section contains OHRC-produced materials. This tip sheet series provides Head Start staff with information on current practice, practical tips for promoting oral health to share with parents, and recipes for healthy snacks that children can make with Head Start staff or at home with their parents. Topics include children with special health care needs, community water fluoridation, dental caries, dental home, fluoride varnish, health literacy, home visiting, injury, nutrition, pregnancy, school readiness, and tobacco. This section contains recent materials, not including OHRC-produced materials. These resources are designed to help oral health professionals in Connecticut screen and counsel their clients who use tobacco products. Contents include a letter that provides information about an evidence-based approach to eliminate tobacco use (the 5 A's), resources and tools, and cessation counseling reimbursement for professionals who participate in the state Medicaid/HUSKY Health programs. Additional contents include questions and answers about the state quit line, a quit line wallet card, information about treatment methods, a quit tips note sheet, and a poster with tips from former smokers. The wallet cards and posters are available in English and Spanish. This report summarizes a pilot project to reduce tobacco use and improve oral health by training oral health professionals on recommended guidelines for tobacco dependence treatment. Contents include information about the participating dental clinics, reimbursements for clients receiving tobacco dependence interventions, administrative support activities, project outcomes, and next steps. Training pretest, mid, and posttest surveys results; and final report numbers and comments are included. This toolkit provides information on how oral health professionals can develop a tobacco-cessation-intervention program and outlines key roles for each member of the oral health team. Contents include information about tobacco use and prevalence, risks of tobacco use, secondhand smoke, benefits of cessation, nicotine and the physiology of dependence, tobacco-cessation counseling, pharmacotherapy, insurance coverage and coding, the role of dentists and the dental team, barriers and solutions, and resources. This report chronicles the consequences of 50 years of tobacco use in the United States. Topics include the relationship between smoking and health outcomes; smoking-attributable morbidity, mortality, and economic costs; patterns of tobacco use among children, adolescents, and adults; status of and future directions in tobacco control; and a vision for ending tobacco-caused death and disease. World Health Organization. 2017. WHO monograph on tobacco cessation and oral health integration. Geneva, Switzerland: World Health Organization. This monograph provides information about systematic reviews of the association between tobacco use and oral diseases and potential benefits of tobacco-use cessation on oral health outcomes. For each systematic review, the methodology, results, and a discussion are presented. The monograph also includes policy recommendations related to integrating brief tobacco interventions into oral health programs in primary care.